The Lehigh & New England was a rarely photographed hometown railroad which traversed a tumultuous scenic route through Pennsylvania, New Jersey and New York states. Though known as being coal carrier, it also carried cement, slate and some merchandise traffic. Its paint scheme represented the railroad's two primary online commodities; black for coal and white for cement. The railroad's bulls-eye or �fried egg� herald is a variation of its parent Lehigh Coal & Navigation Company's �Old Company Lehigh� logo. Although 50 years have passed since its demise, the Lehigh & New England's early exit from the railroad scene and its all Alco diesel roster continues to stir interest among railfans today. In Volume 1 we'll look at operations of the mainline from Hauto to Pen Argyl and the Catasauqua, Bethlehem and Allentown branches between 1949 and 1961, through the films of Charlie and Ken Bealer, Arthur Angstat and the rare Randolph Kulp film collection of the Lehigh Valley Chapter NRHS. Lorenzo (Udine, Italy) on 2014-12-13 06:34:36. Wonderful footage of a long gone rail company that shared to coal era of the US. Although this action was filmed back in the 60s, it was taken with best quality available and even the audio is good enough. I don't now if any of this DVD made it to other parts of Europe, surely here in Italy I'm pleased I'm a proud owner of them! Robert Burns (Hamlet North Carolina) on 2015-03-20 19:25:25. Great Video! I enjoyed it thoroughly. I look forward to purchasing the other two volumes. Robert (Clinton, MS) on 2015-02-10 12:23:18. A great video of what I consider to be the good ole days of railroading. Very interesting and informative. Fred (Tuscola, IL) on 2013-04-27 06:53:00. As for younger viewers, it would be for perhaps teenage fans of the L&NE and the northeastern Pennsylvania area. This line was gone way before they were born. Firm quality is excellent for the time. This was filmed 50-60 years ago on 8mm cameras unlike today's video so you have to rate it on the technology and the user ability of the day cannot be compared not to today's standards. If these guys didn't do it then, we wouldn't have it today. Overall a great piece of history saved for us who remember the L&NE in the day when it was operating. 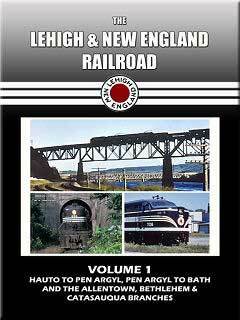 It's a must have if you are a railfan or rail historian of the L&NE and the PA cement belt.